This weekend the place to be is at the Thames Festival. 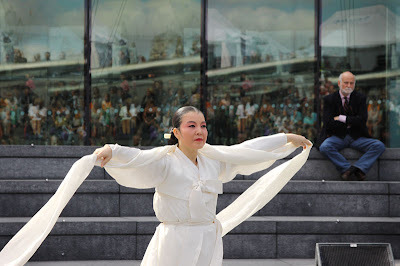 I started at the scoop (the amphitheatre next to city hall) and watched traditional Korean dancing, music and taekwondo. As I wandered along the riverside I saw stalls, loads of different food, circus acts, free run, dance classes, clay pot making and firing in an actual fire on the bank of the Thames, the amazing fire garden outside the Tate Modern, and finished it all off with the feast on the bridge. I thought last years festival was great but this year is even better. No time to sit at the computer today I have to get back to today's festival offerings. Don't forget that I will have a super duper competition coming up in a few days. I like your photo, and I like the way you have managed to add the "observer" too into your shot. Goos shot, Mo. Love the reflection of the crowds in the windows. Hope to see more photos of the festival - sounds fab. How much I'd love to be there! But see it through your eyes in your wonderfuls pics is already such a joy! Have a terrific time! Beautiful capture. I like the reflections in the windows of the crowds. Very nice indeed. Sounds like a brilliant event! And it wouldn't be the same without that man sitting there. Don't know how you manage to come up with such consistently interesting images! I was there too, but missed this performer. Wasn't the weather perfect for it!